Now forget about a dedicated touch surface which is often susceptible to screen damage. GoTouch Pen by Anyractive offers a smart ever touch pen solution with easy setup and quick function. 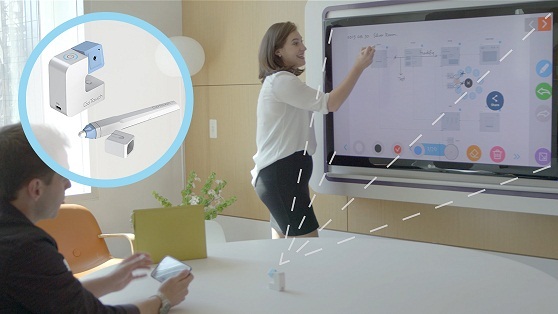 The GoTouch works by connecting it to a smartphone or pc, connected to an external surface, which is later broadcasted to a surface of your choice. Although an overall setup takes a little time before you start using a touch pen, it might not be suitable for quick regular note down things such as Samsung's galaxy note devices. Still, its overall touch functions and writing experiences are highly productive for professionals and presentation lovers. All you need is to download a separate app before you can start projecting, linking it to your smartphone with Android or iOS, then connecting pen over Bluetooth and yes, all it will take some little time. But surely, GoTouch is a cool solution for all those business and marketing guys. An overall operation of Go Touch is quite impressive with its pocket-sized projector and handy touch-sensitive pen, however, the GoTouch camera works just perfect. GoTouch is a recent Korean concept, so if you want to buy this gadget, you need to be fluent in the Korean language as it is currently available on company's online store. Overall, the GoTouch is a great idea, but you might be fed up with its little annoying setup and steps needed.